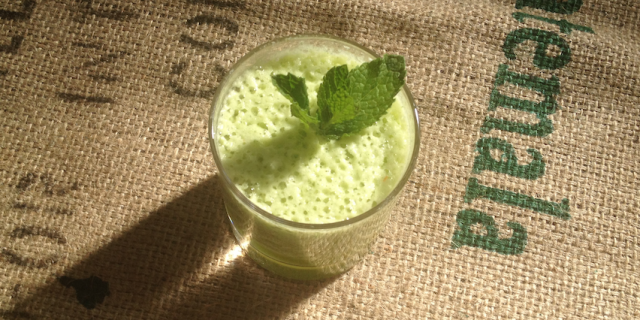 This Pineapple Mint Cucumber Smoothie reminds me of Ibiza and hot summers. At one of my favorite restaurants on Ibiza, Paloma, I would have always order a juice with pineapple and fresh mint. This Pineapple Mint Cucumber Smoothie combines those same flavours adding cucumber and young coconut juice for even more refreshment. It’s a great drink on a hot summer day but also a fantastic electrolyte boost after a long workout. Replenishing electrolyte levels is crucial for recovery after a workout and can help boost performance in the long run. Most store-bought sport drinks, however, are loaded with sugar, additives and have little or no nutritional value. If you regularly exercise for more than an hour, replenishing electrolyte levels and getting the right nutritional building blocks in your body is a must. Making your own sport drink to accelerate recovery using plant-based sugars, carbs and proteins is clearly a much healthier option than buying ready-made sports drink. It replenishes energy and electrolytes and reduce recovery time in between trainings. Want more quick and easy recovery drink recipes? Check out my Alkalising Recovery Juice or my White Lightning Juice. Add all ingredients to a high-speed blender, pulse until smooth and enjoy right away!